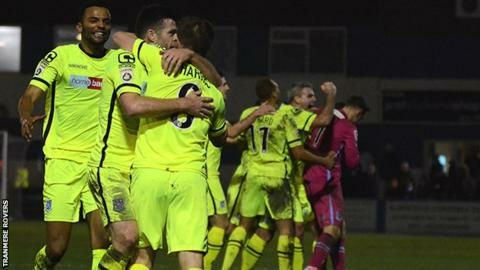 Tranmere Rovers came from two goals down with a minute left to score three and earn a stunning win at Barrow. An Adam Mekki penalty put Gary Brabin's side ahead early on but Jason Walker's penalty, a Simon Grand header and Andy Cook's tap-in put the hosts in control. Back-to-back defeats loomed for Rovers but Lois Maynard's 89th-minute drive sparked a frantic finish and Jeff Hughes rounded the keeper to level. Substitute Jake Kirby's deflected 95th-minute strike sealed an incredible win. Rovers' manager Gary Brabin said his side showed "real character" to earn a win they "deserved" in what was possibly the National League's most thrilling fixture this season. Hughes' first Tranmere goal was the pick of the finishes and his side - relegated from the Football League last season - are now eighth and looking towards the play-off places. "Heart rate has just come back down to normal," read the Tranmere Rovers Twitter account on full-time. The club's social media offering burst into life as the three goals flew in between minutes 90 and 95. Indeed, Rovers managed as many goals in six minutes as they had in three games. Supporter Ryan Ferguson tweeted: "This club will be the death of me one day. From all-out meltdown to mind-blowing euphoria in the space of five minutes. Stunned." Do they wish it had been off? While Rovers now have three wins from four, Barrow face the added pain of knowing the last-ditch turnaround leaves them without a National League win since November. The club's Twitter account perhaps understandably delivered a sombre tone in comparison to that of their visitors. A healthy 1,766 fans turned out for a game which underwent a 09:15 GMT pitch inspection at Holker Street. After such a tough-to-take defeat, Paul Cox's side may well be wishing the weather had granted them a day off. Match ends, Barrow 3, Tranmere Rovers 4. Second Half ends, Barrow 3, Tranmere Rovers 4. Goal! Barrow 3, Tranmere Rovers 4. Jake Kirby (Tranmere Rovers) right footed shot from outside the box to the top left corner. Foul by Lois Maynard (Tranmere Rovers). David Symington (Barrow) wins a free kick. Neil Ashton (Barrow) is shown the yellow card. Goal! Barrow 3, Tranmere Rovers 3. Jeff Hughes (Tranmere Rovers) left footed shot from the left side of the six yard box to the centre of the goal. Goal! Barrow 3, Tranmere Rovers 2. Lois Maynard (Tranmere Rovers) right footed shot from outside the box to the top left corner. Goal! Barrow 3, Tranmere Rovers 1. Andy Cook (Barrow) right footed shot from the right side of the six yard box to the bottom left corner. Assisted by Jason Walker. Attempt saved. Cole Stockton (Tranmere Rovers) right footed shot from outside the box is saved. Substitution, Tranmere Rovers. Jake Kirby replaces Adam Mekki. Attempt blocked. Andy Haworth (Barrow) right footed shot from outside the box is blocked. Attempt blocked. Cole Stockton (Tranmere Rovers) header from the centre of the box is blocked. Assisted by Jeff Hughes. Attempt missed. Jeff Hughes (Tranmere Rovers) right footed shot from the centre of the box misses to the right. Goal! Barrow 2, Tranmere Rovers 1. Simon Grand (Barrow) header from the centre of the box to the top right corner. Assisted by David Mellor with a cross. Attempt saved. Jordan Williams (Barrow) header from the centre of the box is saved. Simon Grand (Barrow) wins a free kick. Substitution, Tranmere Rovers. Cole Stockton replaces Ben Tomlinson. Jordan Williams (Barrow) is shown the yellow card for a bad foul. Foul by Jason Walker (Barrow). Steven Jennings (Tranmere Rovers) wins a free kick. Offside, Tranmere Rovers. Ben Tomlinson tries a through ball, but Ben Tomlinson is caught offside. Foul by Niall Cowperthwaite (Barrow). Adam Mekki (Tranmere Rovers) wins a free kick. Attempt missed. Steve McNulty (Tranmere Rovers) header from the centre of the box is too high. Foul by David Mellor (Barrow). Lois Maynard (Tranmere Rovers) wins a free kick. Attempt saved. Lois Maynard (Tranmere Rovers) header from the centre of the box is saved. Goal! Barrow 1, Tranmere Rovers 1. Jason Walker (Barrow) converts the penalty with a right footed shot to the centre of the goal. Penalty conceded by Lee Vaughan (Tranmere Rovers) after a foul in the penalty area. Penalty Barrow. Jason Walker draws a foul in the penalty area.